Peaches Campbell purchased the Riverside Offy from John Stanfield and changed its name back to the O’Day Offy. The webmaster has attempted to incorporate the paint schemes of the O’Day Offy into this web page. The car was painted black with a red #1 in 1941 and was still painted those colors at least into the 1960s. Frank Baldauf purchased the #1 O’Day Offy from Peaches Campbell early in 1953 and the car became the Baldauf Offy. Does not show up in published race results of this date. Both the O’Day Offy driven by Ben Musick and a car driven by Harry Robtoy showed up at Danville, Illinois with cars that each carried #1. For that one day, officials changed the number on Robtoy’s car to #1W since his car was white and they changed the number on the O’Day Offy to #1B since it was black. 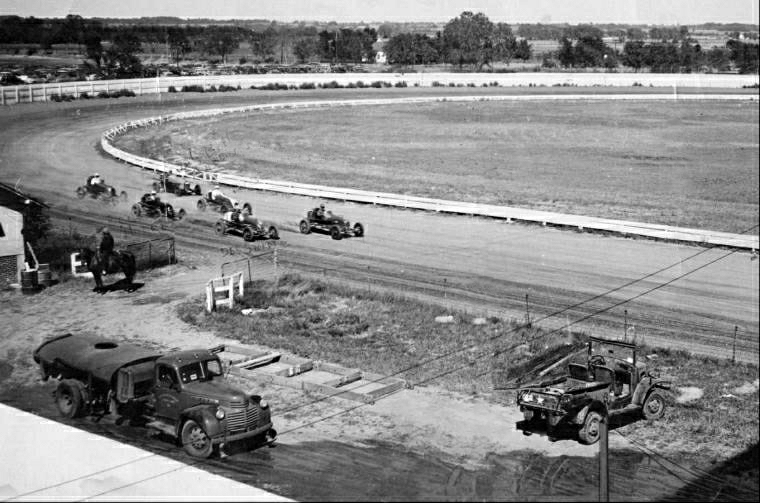 Both the O’Day Offy driven by Bill Hooper and a car driven by George Lynch showed up at this race with cars that each carried #1. Officials changed the number on Lynch’s car to #1W since his car was white and they changed the number on the O’Day Offy to #1B since it was black. Red Hodges defeated Rabbit Musick who was driving a Peaches Campbell Offy #2. The Racing Corporation of America (R.C.A.) was a subsidiary of I.M.C.A. and sanctioned what were called “B” races. Less prize money was posted for these “B” races which were usually skipped by the top I.M.C.A. competitors. Local drivers were encouraged to compete in these events on temporary permits. That was attractive since they would not have to compete against the top teams. “B” races usually did not draw very large crowds though.